Early French and Spanish settlers influenced the legal system in Louisiana. Despite popular belief, it is incorrect to say that the Louisiana Civil Code is, or stems from, the Napoleonic Code. Although the developing Napoleonic Code influenced Louisiana law, the Napoleonic Code was not enacted until 1804, one year after the Louisiana Purchase. A main source of Louisiana jurisprudence may in fact be Spanish. The resulting system of "civil law" in the Louisiana does differ from the "common-law" systems in the other 49 states. Ironically, it was the Spanish who built many of the colonial structures that still stand in the "French Quarter" of New Orleans, and Spanish is still spoken in some communities, particularly in St. Bernard Parish below New Orleans. Hundreds of German families were recruited in 1719 by the Company of the West (which held the French royal charter for the development of Louisiana), and those sturdy pioneers settled upriver from New Orleans along a section of the Mississippi River that is still called the Cote des Allemands ("German Coast"). The parishes north of Lake Pontchartrain (the sixth largest lake in the U.S.) and east of the Mississippi River were once a part of British West Florida, occupied by English planters and military in the 1700s. Bernardo de Galvez, Louisiana's Spanish governor and an American ally in the Revolution, prevented the further development of a British stronghold in the Mississippi Valley by capturing British forts at Manchac and Baton Rouge in 1779. Some years later, in 1810, citizens of the "Florida Parishes" staged the West Florida Rebellion against Spanish authority in the region. They established the West Florida Republic, which enjoyed independence briefly before joining the American territory that had been acquired from France through the Louisiana Purchase of 1803. Among the other nationalities that have settled in Louisiana are the Yugoslavians who made a success of oyster harvesting along the Gulf Coast and the Hungarians who became cultivators of strawberries and other crops in the Albany area. Free blacks amassed some of Louisiana's largest land holdings prior to the Civil War and blacks have major contributions to Jazz and Louisiana cuisine in particular. And many of Louisiana's annual festivals are celebrations of particular ethnic contributions to the "cultural gumbo" of this unique state. No other state has a more varied or colorful past than Louisiana. The state has been governed under 10 different flags beginning in 1541 with Hernando de Soto's claim of the region for Spain. La Salle later claimed it for Bourbon France and over the years Louisiana was at one time or another subject to the Union Jack of Great Britain, the Tricolor of Napoleon, the Lone Star flag of the Republic of West Florida and the fifteen stars and stripes of the United States. At the outbreak of the Civil War, Louisiana became an independent republic for six weeks before joining the Confederacy. Earlier, in 1803, Louisiana had become a part of the United States because of the region's importance to the trade and security of the American mid-west. New Orleans and the surrounding territory controlled the mouth of the Mississippi River down which much of the produce of the mid-west travelled to reach market. To get the vital region in American hands, President Thomas Jefferson negotiated the Louisiana Purchase with Napoleon. With the acquisition of Louisiana, Jefferson nearly doubled the size of the fledgling U.S. and made it a world power. Later, 13 states or parts of states were carved out of the Louisiana Purchase territory. Through much of its early history Louisiana was a trading and financial center, and the fertility of its land made it one of the richest regions in America as first indigo then sugar and cotton rose to prominence in world markets. Many Louisiana planters were among the wealthiest men in America. The plantation economy was shattered by the Civil War although the state continued to be a powerful agricultural region. The discovery of sulphur in 1869 and oil in 1901, coupled with the rise of forestry sent the state on a new wave of economic growth. Eventually, Louisiana became a major American producer of oil and natural gas and a center of petroleum refining and petrochemicals manufacturing, which it remains to this day. The French province of Acadia (today's Nova Scotia and surrounding regions) was settled in the 1600s by French colonists, but the area became a British possession soon afterwards. In 1755, as war neared between France and England, the British authorities demanded that the Acadians renounce their Roman Catholic faith and swear allegiance to the Crown. The Acadians refused and the mass exile that followed is well known to all who have read Henry Wadsworth Longfellow's "Evangeline". The migration of the French Acadians to Louisiana was neither smooth nor immediate. Many were shipped to the New England colonies, others to the West Indies or back to France, and many wandered for 20 years before learning that they were welcome in the predominantly French territory of Louisiana. Here they established small farms along the Mississippi River, Bayou Teche, Bayou Lafourche and other streams in the southern part of the region. Fishing and trapping villages were established in the swamplands. Cajun (the word is a corruption of the original French pronunciation of Acadian--A-ca-jan) Country today lies within a triangle whose base is the Louisiana coast and whose apex is near Alexandria in the central part of the state. The triangle contains 22 parishes and the region's principal city, Lafayette, is the unofficial capital of "Acadiana". Cajun cooking may be a first cousin to the Creole cuisine of New Orleans, but there is none other quite like it in the world for the imagination of its dishes or the artistic robustness of its seasoning. Favorite Cajun dishes include jambalaya, gumbo, turtle sauce piquante, andouille sausage, boudin (a pork and rice sausage), cochon du lait, soft-shell crab, stuffed crab, a hundred shrimp dishes, crawfish etouffee, crawfish bisque, crawfish pie, and dozens more. Cajun music can be lively or melancholy - and sometimes both at once. The traditional instruments are fiddle, accordion and triangle, and those still dominate (although drums and guitars have found their way into Cajun bands in recent years). Like the spoken language of the Cajuns, the lyrics of their songs are part French, part English. The themes are universal, love (lost and found) and the beauty of their land, but the melodies and phraseology are unique. Originally farmers, trappers and fishermen, today's Cajuns occupy virtually every occupation and are the backbone of the state's oil and gas exploration and production industry, particularly offshore. When oil was first discovered in the North Sea more than 5,000 Cajuns with experience working on oil rigs in the open sea were employed to drill the first wells and to provide training. Along with its food and music, the major trademarks of Cajun Country are pirogues (canoes made from a single cypress log), Spanish moss, alligators, swamps, bayous and "Cajun Cabins". The Louisiana plantation culture first came into being along the state's rivers and bayous in the 18th century. Planters initially used the fertile soil for indigo and tobacco, but these crops were soon replaced by cotton in north Louisiana and sugar cane in the more tropical southern part of the state. Sugar and cotton made the great mansions possible, but the designs of the homes came from as many directions as did the planters themselves. The first house type was the Creole Raised Cottage, whose core design came from the West Indies. Its great umbrella-like hipped roof came from Canada and its wide galleries and turned colonettes (slender wooden columns) were developed in Louisiana. The earliest furnishings of the homes were made of oak or cypress by slaves on the plantations. Later, in prosperous years, European craftsmen came to Louisiana. European furnishings and art were imported through New Orleans and other ports. The plantation mansions of Louisiana still bear signs of efforts to make life in the new world as genteel and pleasant as possible. Many are surrounded by extensive formal gardens, and the approaches to some of the homes are lined with avenues of live oaks that are now huge in their old age. The brown pelican is Louisiana's official bird. Pelicans are famous for their large bill, the lower portion of which has a pouch that can be greatly extended. The state tree is the bald cypress. Its shape, which varies from columnar to conical (bottle-shaped), depends greatly on the amount and duration of flooding in the area. The bark is reddish-brown, fibrous, thin, and divided into small, flat ridges and shallow furrows. Leaves of the cypress tree spread in flat planes in the feathery pattern on its branches. The Catahoula Leopard Dog is the official state dog. It is a cross of the domestic dog the Indians of the Catahoula Lake region raised and the Spanish "war dog" that came through the area in the early 1500s. The Catahoula has unusual glassy eyes, webbed feet, a spotted coat, and is gentle with children. The large, creamy-white bloom of the magnolia tree was designated the state flower in 1900 because of its abundance throughout the state. The magnolia is an evergreen and the flower is unusually fragrant. The Louisiana flag contains a crest centered on a blue field. The crest consists of a nest bearing three chicks, a mother pelican vulning herself with her head turned to the viewer's right and displaying three drops of blood on her breast. Beneath the nest a white banner bears the state motto "Union Justice Confidence." You can obtain a high resolution image of the state flag on the Secretary of State's site. 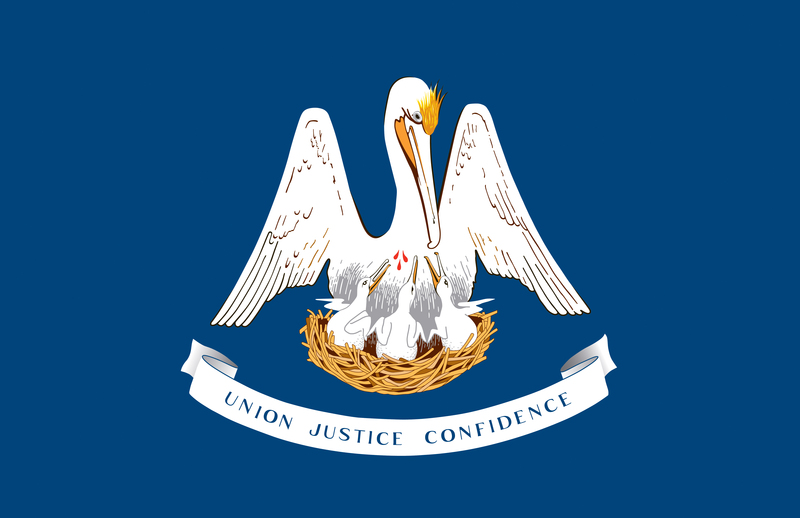 State Seal: A pelican and her nest, surrounded by the state motto "Union, Justice, Confidence" and the words "State of Louisiana". Government: State Constitution of 1974 provides for 3 branches of government: Executive, Judicial, and Legislative. The Executive Branch is headed by the governor who is elected for a four year term. The Judicial branch is headed by the Louisiana Supreme Court. The Legislative branch consists of 39 State Senators and 105 State Representatives. All are elected for four year terms. Other State Symbols: Reptile: alligator. Mammal: black bear. Musical Instrument: diatonic accordion. Freshwater fish: white perch. Fossil: petrified palmwood. Drink: milk. Gemstone: agate. Robert Cavalier, Sieur de la Salle, erects a cross at the mouth of the Mississippi River after descending the river from the Great Lakes and claims the territory for Louis XIV of France, for whom Louisiana is named. Louisiana is divided into the Territory of New Orleans (south of 33 degrees latitude) and the District of Louisiana (north of 33 degrees latitude). W.C. C. Claiborne is appointed governor of the Territory of Orleans.